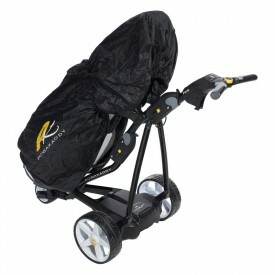 Powakaddy FW7s GPS Golf Trolley with FREE accessory: The FW7 GPS the most technologically advanced electric trolley on the market, this electric trolley leads the way, a world first. The FW7 GPS offers the ability to never miss a yardage on over 30,000 pre-loaded courses worldwide with no subscription or added charges. The GPS device has been incorporated into the FW7 handle and displays yardages to the front, middle and back of the greens, hazards, the distance of shots and even includes a scoring facility all displayed on a 3.5” widescreen. The FW7 GPS will automatically recognise and locate the course and hole in play and even count the calories you burn during play. The FW7 GPS is powered by an almost silent 230-watt Motor that has been awarded the Q, Quiet Mark by the noise abatement society. 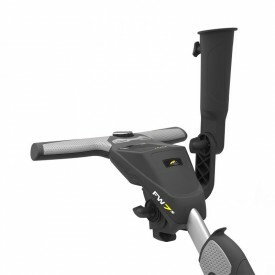 The Battery system is Powakaddy very own Plug and Play; this unique system uses the lightest and thinnest lithium battery available to consumers and offers a full 5-year warranty. Lithium batteries last up to 5 times longer and charge quicker, over their lifespan offers a considerable saving compared to cheaper older lead acid batteries. The new Powakaddy FW7 GPS offers a lightweight Alloy frame and folds easily in three simple moves, low profile wheels ensure a stable base even on uneven terrain. A few extra features that have been incorporated into the design are a USB charger plug, speed display, clock, battery Indicator and a security pin and Powakaddy offers a full 3-year warranty on the FW7 GPS. The FW7 GPS is available in either gunmetal with carbon effect or brushed silver.